How can one use simple means to investigate the visual abilities of animals? This question is being pursued by the research group of Dr. Thomas Münch at the Centre for Integrative Neuroscience at the University of Tübingen. Dr. Münch is, among other things, interested in the restoration of lost visual function. Mice can suffer from similar diseases of blindness as humans, so that new therapeutic approaches can be developed by doing research on mice. Since the treated animals cannot tell us how well they can see, one attempts to draw conclusions about visual abilities from behavioral observations. Animals are commonly trained with food to display a certain behavior in response to color or pattern. This experimental approach, however, is very time-consuming, and training blind animals is nearly impossible. The researchers therefore take advantage of a simple reflex: the optokinetic reflex. This reflex can easily be noticed on a train ride: when observing the landscape from a moving train, the eyes periodically follow the passing landscape. This effect keeps the image of moving objects constant on the retina for a short while. This phenomenon occurs in most animals. A new study published this week in the journal "Behavioral Neuroscience" is based on this effect. 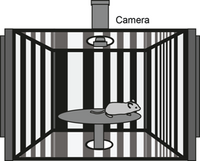 The visual performance of mice was examined using a chamber whose walls were made of four computer screens. The monitors showed a rotating striped pattern. 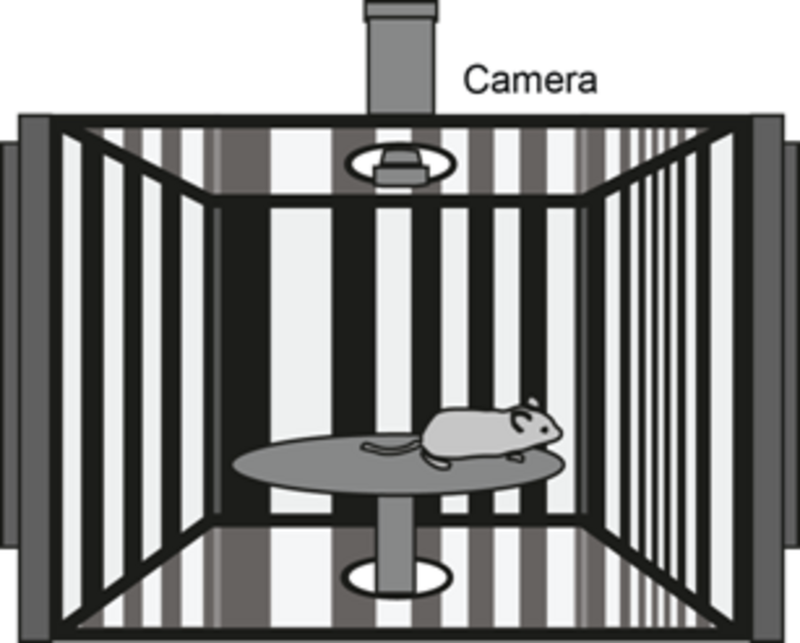 This simulated movement of the environment triggered the optokinetic reflex and the mouse followed the pattern with its gaze - but only when the animal could recognize the striped pattern. This allows the visual performance of each individual animal to be determined. Just as the ophthalmologist can make the displayed pattern finer during vision testing, so too can the displayed pattern be changed until the animal is no longer able to recognize it and subsequently fails the reflex test. The utilization of the computer monitors allows the contrast or resolution of the pattern to be changed in almost any way desired. For the study, doctoral candidate Boris Benkner has developed software that automatically evaluates the animal's behavior and can thus determine the visual ability of an animal in a short time. "In previous studies, it was necessary to tediously analyze each animal's behavior manually," said Benkner. "Our automated method is not only faster but also more objective, because the stripe pattern does also influence the observer when doing the analysis." The senior author of the study, Thomas Münch, sees great potential in the newly developed method to evaluate new treatment strategies for blindness. "Currently, many new ways for treating blindness are being developed, ranging from dietary supplements to optogenetics to stem cell therapy" said Münch. "It is important to scrutinize these therapies from the beginning, to test if they really improve the visual abilities of the treated animals." Boris Benkner, Marion Mutter, Gerrit Ecke, and Thomas A. Münch (2013) "Characterizing Visual Performance in Mice: An Objective and Automated System Based on the Optokinetic Reflex." Innovative. Interdisciplinary. International. Since 1477. These have always been the University of Tübingen's guiding principles in research and teaching. With its long tradition, Tübingen is one of Germany's most respected universities. Tübingen's Neuroscience Excellence Cluster, Empirical Education Research Graduate School and institutional strategy are backed by the German government's Excellence Initiative, making Tübingen one of eleven German universities with the title of excellence. Tübingen is also home to six Collaborative Research Centers, participates in six Transregional Collaborative Research Centers, and hosts six Graduate Schools. Our core research areas include: integrative neuroscience, clinical imaging, translational immunology and cancer research, microbiology and infection research, biochemistry and pharmaceuticals research, the molecular biology of plants, geo-environment research, astrophysics and elementary particle physics, quantum physics and nanotechnology, archeology and prehistory, history, religion and culture, language and cognition, media and education research. The excellence of our research provides optimal conditions for students and academics from all over the world. Nearly 28,000 students are currently enrolled at the University of Tübingen. As a comprehensive research University, we offer more than 280 subjects. Our courses combine teaching and research, promoting a deeper understanding of the material while encouraging students to share their own knowledge and ideas. This philosophy gives Tübingen students strength and confidence in their fields and a solid foundation for interdisciplinary research. The Werner Reichardt Centre for Integrative Neuroscience (CIN) is an interdisciplinary institution at the University of Tübingen funded by the DFG’s German Excellence Initiative program. Its aim is to deepen our understanding of how the brain generates functions and how brain diseases impair them, guided by the conviction that any progress in understanding can only be achieved through an integrative approach spanning multiple levels of organization.